See below for my current and past research projects! Overfishing of marine ecosystems threatens biodiversity and the viability of fisheries. 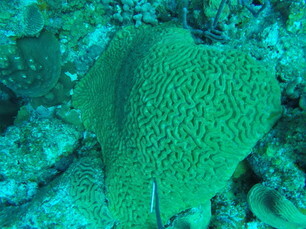 In recent decades, coral cover has declined on many Caribbean reefs due to disease and ocean warming. Other invertebrates and macroalgae have replaced corals as the most dominant taxa and the remaining coral are nearly all weedy species, negatively altering reef ecosystem functioning. The primary management response to this global phenomenon has been the design and implementation of Marine Protected Areas (MPAs). MPAs restrict fishing access in select locations, but poaching and lack of enforcement limit their broader success. A recent 16-site, 4-year study (Cox et al. 2017) found that the establishment of MPAs did not restore coral reef communities in Belize. ​We expanded this work by analyzing a 20-year time series of underwater benthic video transects across the Belizean Barrier Reef (BBR). Roughly half the sites were in MPAs or no-take marine reserves. I am currently analyzing the data for this project, but preliminary results suggest stark declines in coral cover and increases in macroalgal cover, regardless of management status. This suggests that just management alone is not enough to restore marine populations, but initiatives must be developed to more directly involve and incentivize local communities to sustain marine resources. 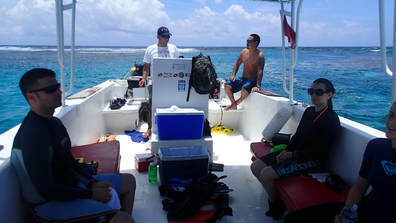 Here, our team of researchers prepare to SCUBA dive to select sites along the BBR to count and identify fish species and obtain videos of the seafloor for analysis. This is an example of one of the images extracted from the underwater video transects. It was analyzed for percent cover of coral, algae, and other seafloor elements. One such initiative to involve communities in management decisions is a TURF program--or "Territorial User Rights for Fishing"--where in exchange for being given rights to fish in particular areas, fishers must report their catch to management officials. This encourages environmental stewardship in coastal communities by providing effective ownership of fish stocks, ideally preventing the "race to fish" paradigm, which can lead to social and economic benefits for fishers. In 2011, the first TURFs in the Caribbean were established in Belize and they were combined with two pre-existing marine reserves: the Port Honduras Marine Reserve and the Glover's Reef Marine Reserve. As of June 2016, a nation-wide TURF system was implemented by the Belize Fisheries Department, and seven additional TURFs were added to pre-existing marine reserves. Research to examine the impact of TURFs from social and ecological impacts is limited, despite catch improvements reported by fishers in the program. 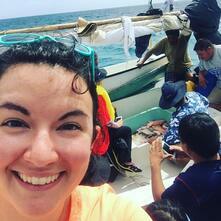 One of the objectives of my dissertation is to evaluate the efficacy of Belize's TURF program in restoring overfished stocks, general biodiversity and ecosystem functioning, as well as improving the livelihoods of fishers. I seek to collaborate with the Belize Fisheries Department and several local Non-Governmental Organizations (NGOs) to use the socio-ecological systems framework to implement a socio-economic survey of fishers and compare fisher logbook data to underwater ecological survey data. On a trip to the Turneffe Atoll Marine Reserve in May 2017, we ecountered sailboat fishermen who had been at sea for 5 days. They had snappers, lionfish, barracuda and conch in their ice box. 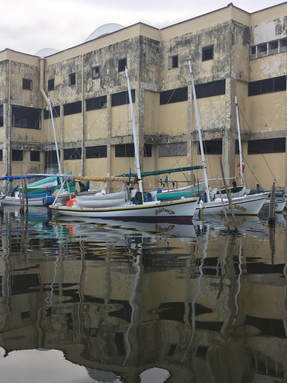 Here are several sailboats docked near the fishing cooperative in Belize City. This photo was taken right before conch season opened. The next day, all boats were out at sea.